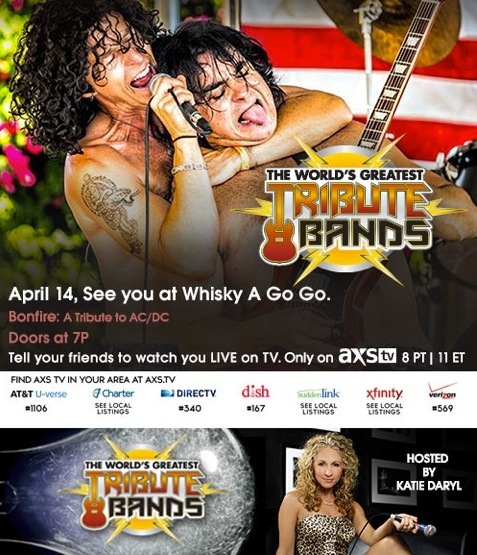 April 14th 2014, The Whisky-A-Go-Go, West Hollywood CA: Season 3 of AXS TV’s “World’s Greatest Tribute Bands” series is coming to its home stretch, and last night at the Whisky-A-Go-Go the penultimate episode of the season took place with Los Angeles’ very own AC/DC tribute band Bonfire performing in front of a packed house, broadcast live on AXS TV and hosted as usual by Katie Daryl. 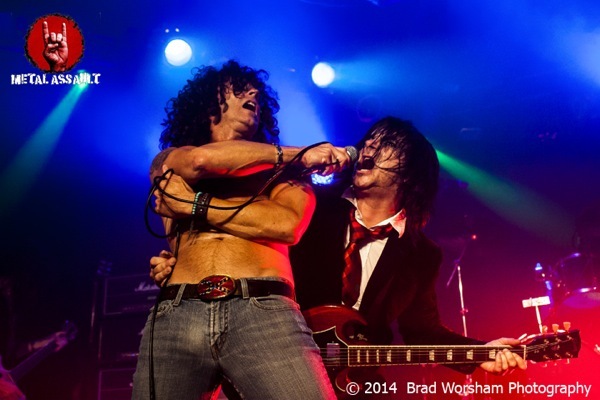 Bonfire has been in existence for a whopping 14 years, giving it their all to pay homage to the Bon Scott era of the legendary Australian rock band, but this show was going to be their biggest one yet, and promised to encapsulate all those years of their hard work in a 60-minute performance. Bonfire being an LA-based band, there was greater local interest in this show as compared to some of the other ones in the series, as was evident from the long line of people waiting outside the venue as early as 6:30 PM. Doors opened at 7 and the Whisky was packed within no time. I somehow had a feeling this was going to be one of the best, if not the best tribute show AXS TV has done yet, and as it turned out, I wasn’t wrong. AC/DC fans had turned up in huge numbers and the anticipation surrounding Bonfire’s appearance was massive. Some of the attendees were even wearing the Angus Young flashing horns, and this gathering at the Whisky was clearly ready for a high-voltage AC/DC jolt. Following Katie Daryl’s intro piece which was accompanied by the loudest crowd cheer I’ve ever heard at any of these AXS shows, Bonfire took the stage, and one tune after another, they rocked this crowd with a set that included the Bon Scott-fronted AC/DC classics as well as deeper cuts like ‘Walk All Over You’, ‘Big Balls’, ‘Rocker’ and ‘Sin City’. Performance-wise, the band was absolutely on top of their game. I’ve seen them a few times in the past on stages of various kinds and sizes in the LA area, but never have they looked and sounded as great as they did last night, and it was perhaps the enormity of the occasion that spurred them on to take their show to the next level. A lot of people think it’s easy to play AC/DC songs because of their musical simplicity, but that’s far from true as it requires the perfect tone and expression to do complete justice to AC/DC’s music, and not everyone can succeed at it, as is clear from the large number of bad AC/DC tribute bands going around in the LA area alone. The singer mentioned that AC/DC had performed on this very stage in 1977, which was apt as Bonfire fully recreated the magic of a live AC/DC show last night, and showed that even almost four decades after its release, this music still holds strong in terms of its sheer impact on an audience and has a timeless quality to it. Bonfire left no stone unturned in making this a truly special occasion for all involved, complete with the singer donning a kilt and playing bagpipes for ‘Long Way To The Top’, and aside from playing the songs right, each member of Bonfire had the exact look of the original band right down to the choice of instruments and amplifiers. All in all, I would have to say this was the best and most high-octane tribute show AXS TV has had yet, and when it comes to paying tribute to AC/DC, Bonfire is clearly the gold standard.